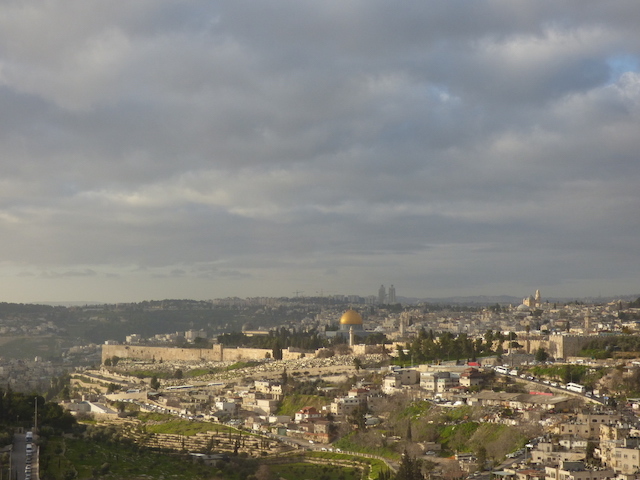 View of the Temple Mount (with the Dome of the Rock) from the top of the Mount of Olives. 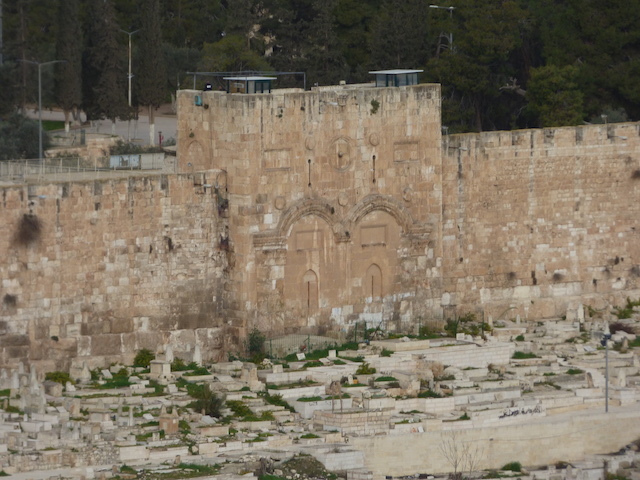 The Golden Gate (east wall of the temple mount). 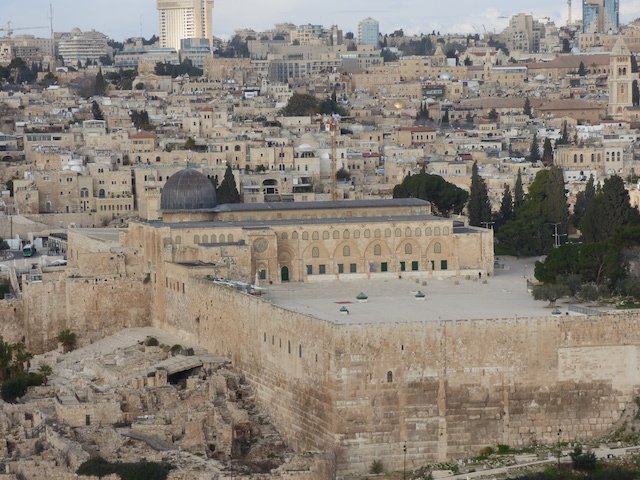 It’s been sealed and a Muslim cemetery placed in front of it. 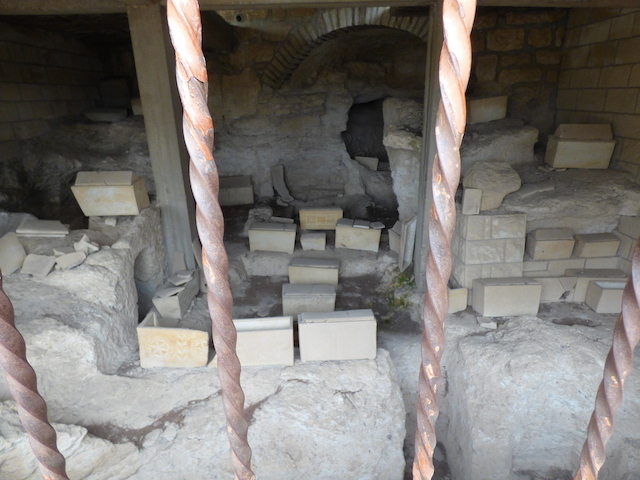 Bone boxes (Ossuaries). 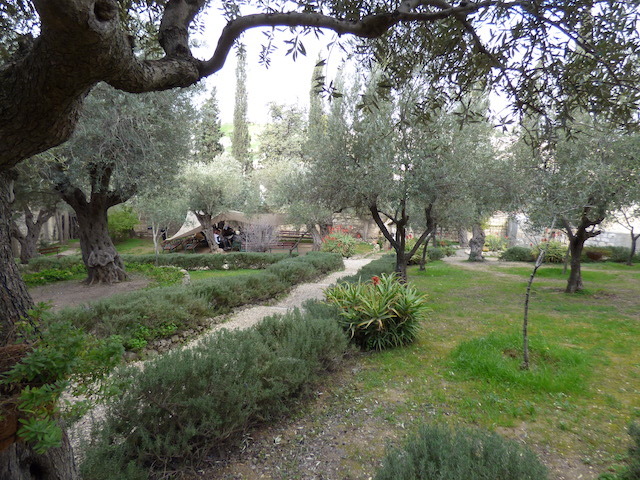 In Jewish burial, the body is wrapped in a shroud until it completely decays. 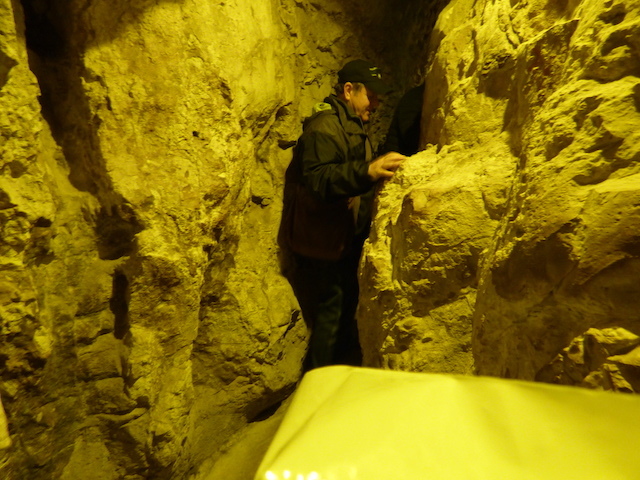 Eventually, when on the bones remain, they are gathered and placed into an ossuary for final burial. 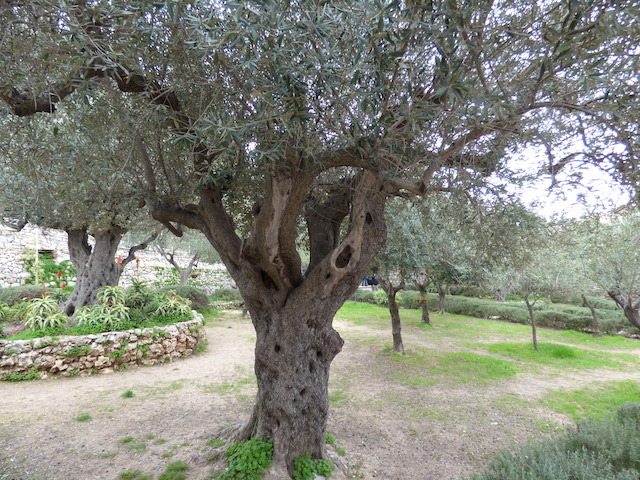 Olive trees in the Garden. 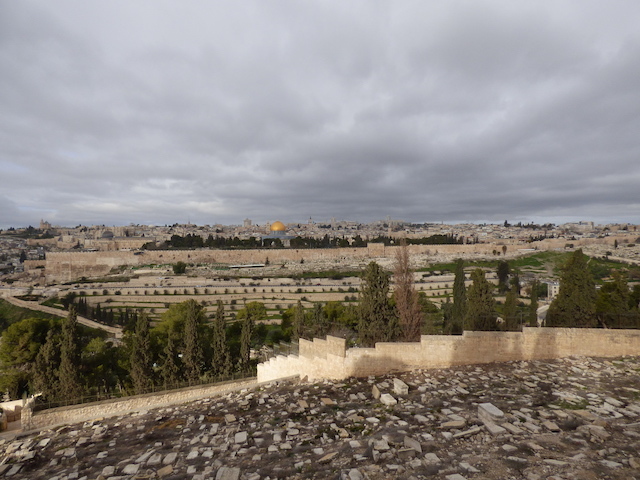 Of course, this is the Mount of Olives! 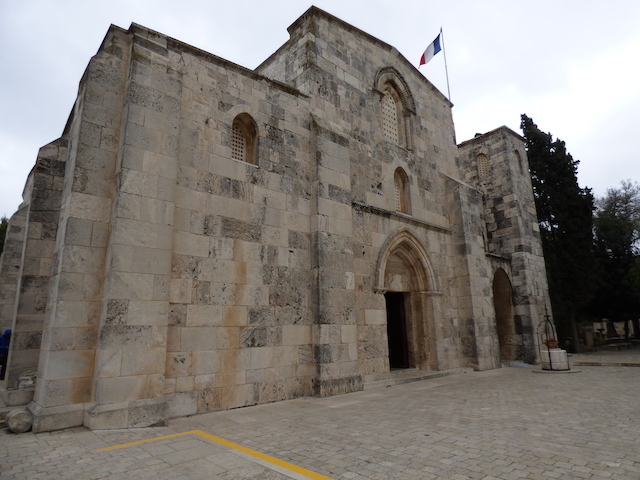 This is the church of Saint Anne. 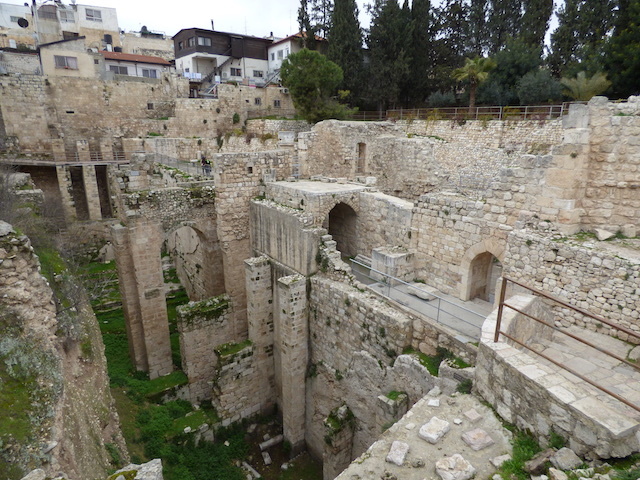 It is immediately adjacent to the biblical site of the Pool of Bethesda. 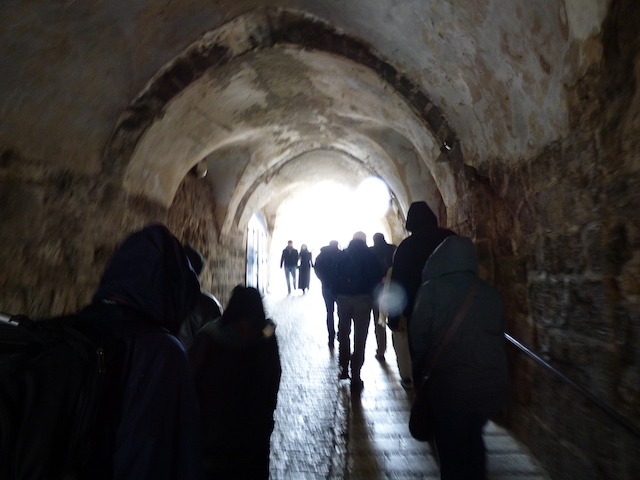 It is known for it’s amazing accoustics. 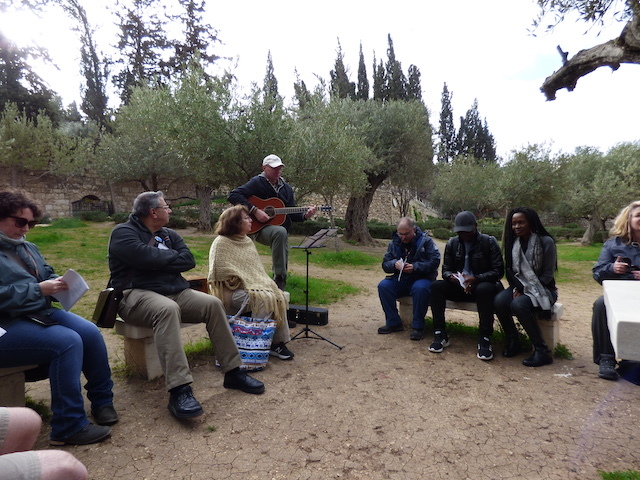 Our small group sang a hymn and it sounded like a 100-person choir! 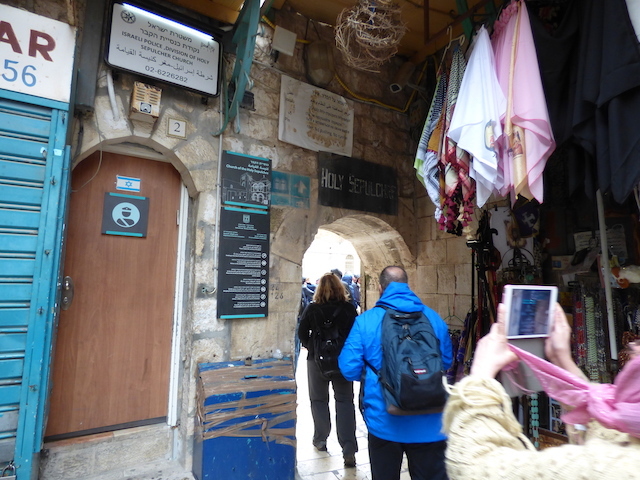 We’re moving to the first station on the Via Delorosa. 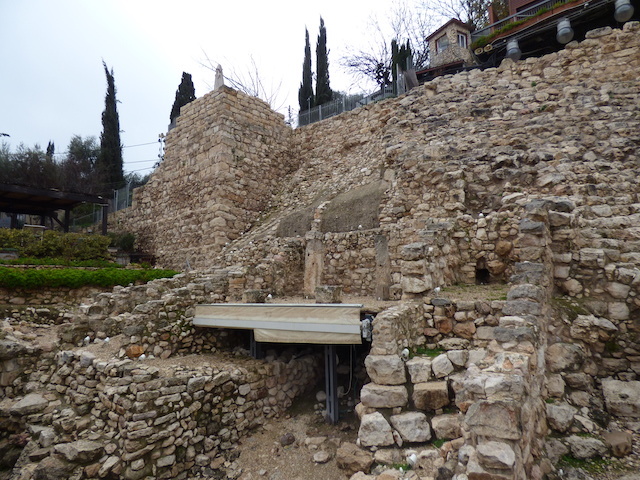 The (now destroyed) Antonia Fortress would have been located immediately to our left. 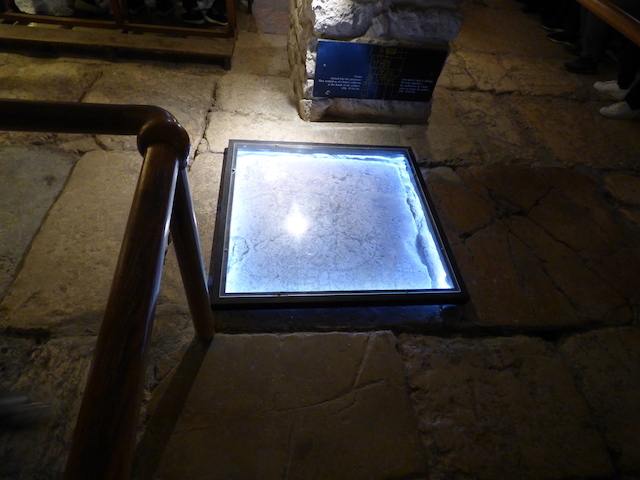 This lighted paving stone is inscribed with a game that Roman soldiers played with prisoners – essentially heads you die, tails you die. 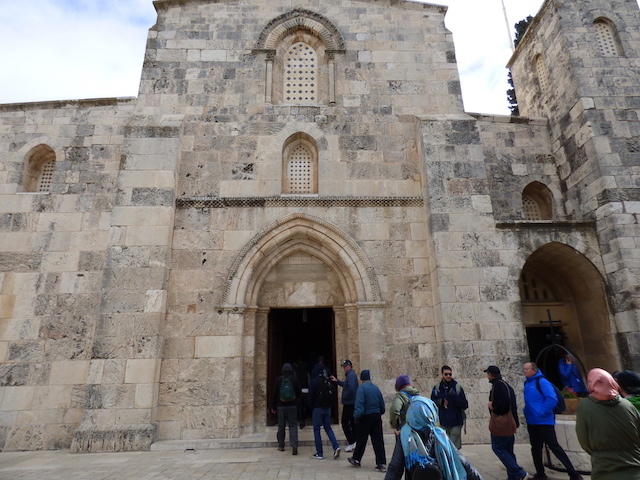 It is believed this is the location where Jesus was forced to pick up his cross and begin His journey to the place of execution. 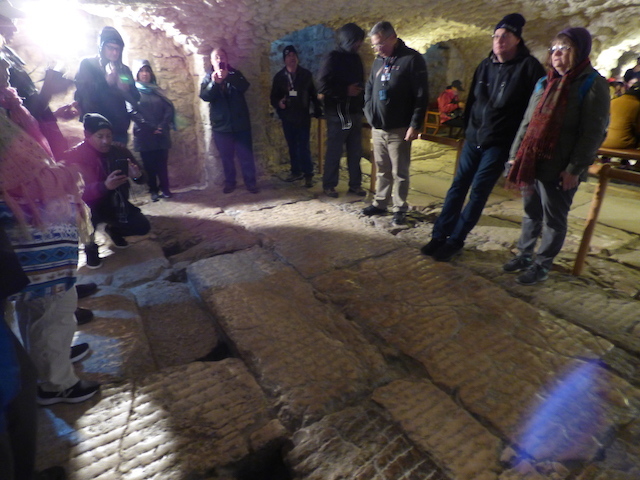 Those are first century paving stones. 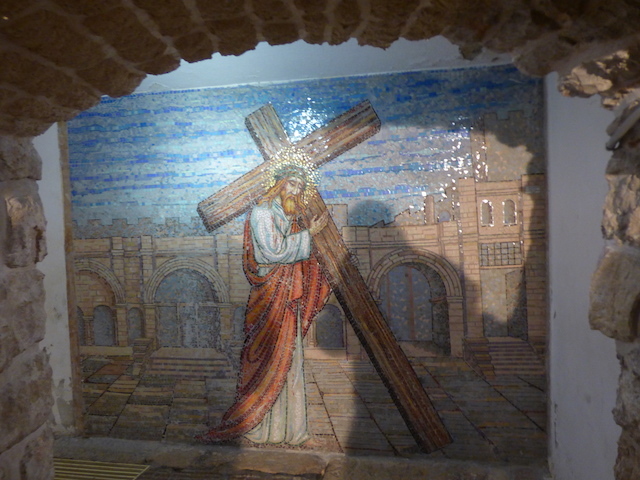 That moment is depicted in a tile mosaic adjacent to the site. 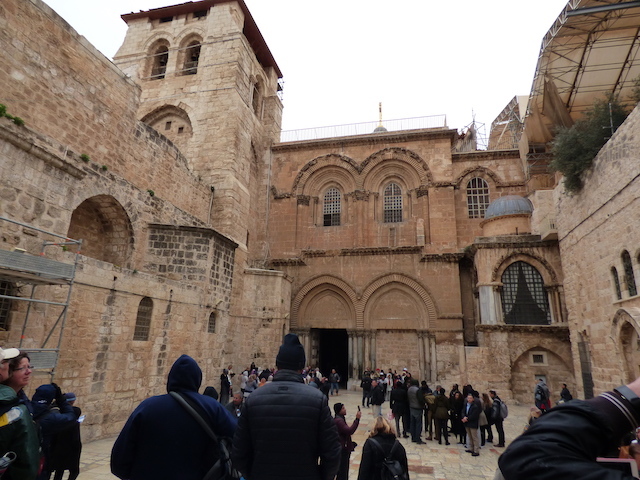 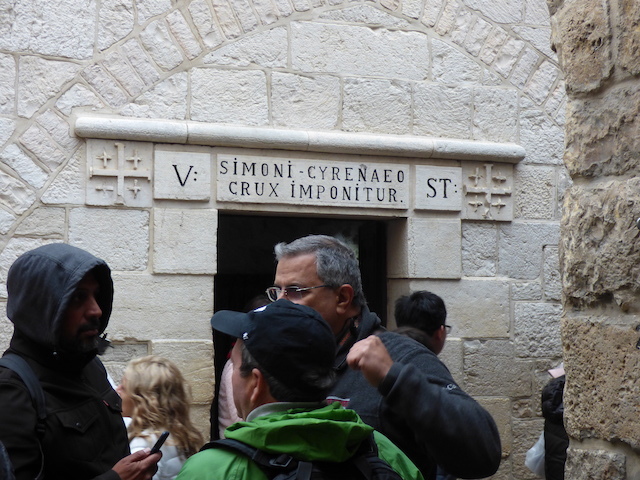 This is the entrance to the square in front of the Church of the Holy Sepulcher. 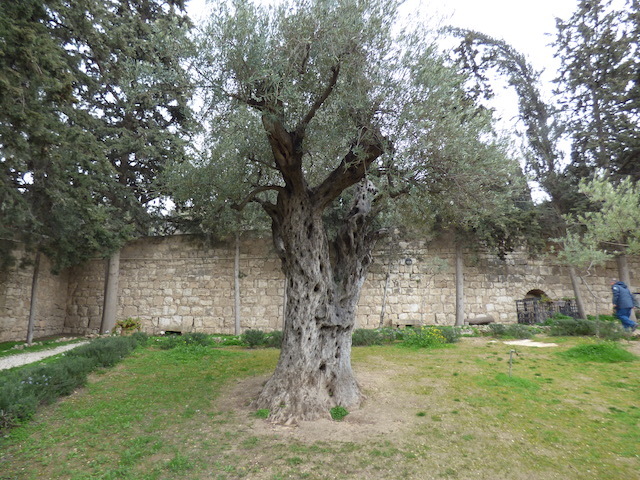 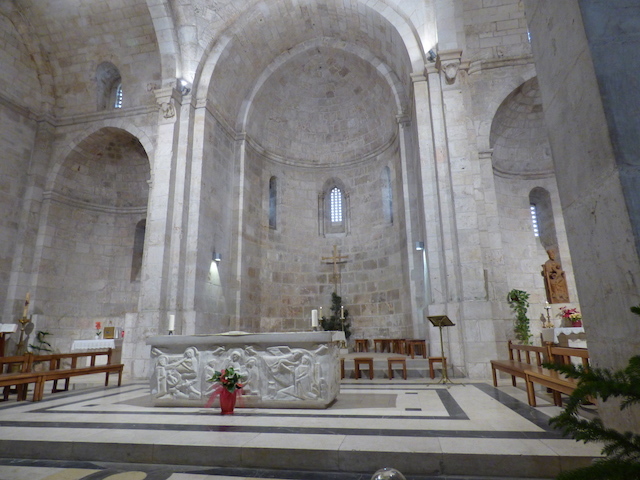 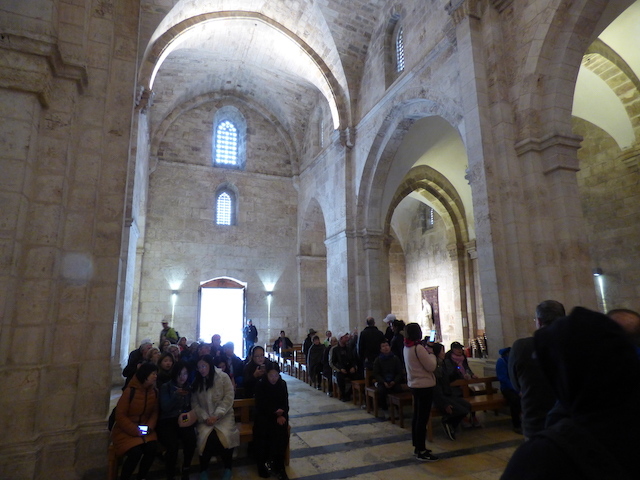 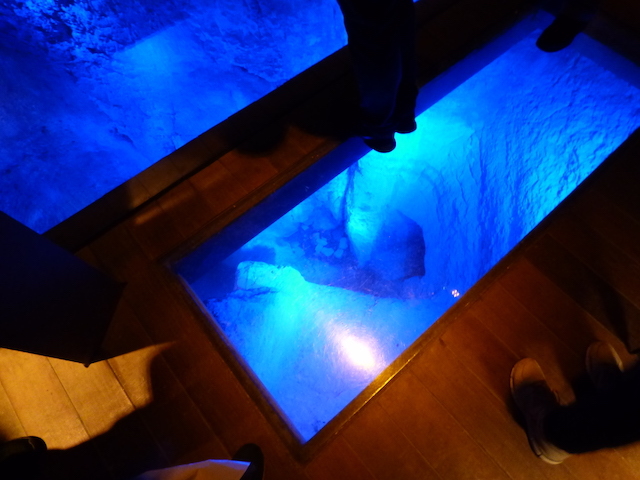 It is traditionally the site where Jesus was crucified and buried. 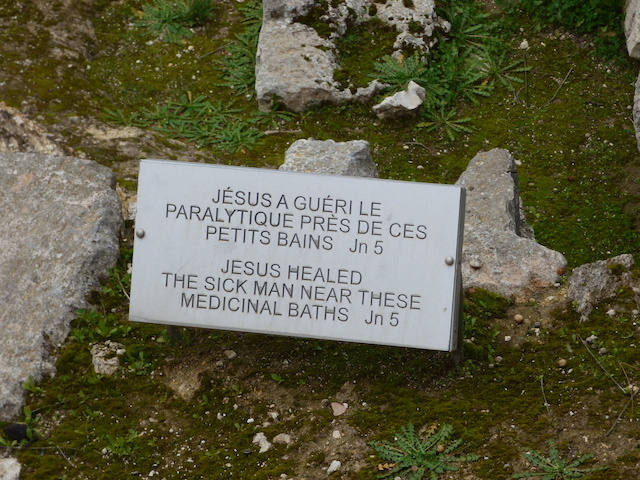 Most evangelicals reject this and believe he was crucified outside the city and buried in the garden tomb (also outside the city). 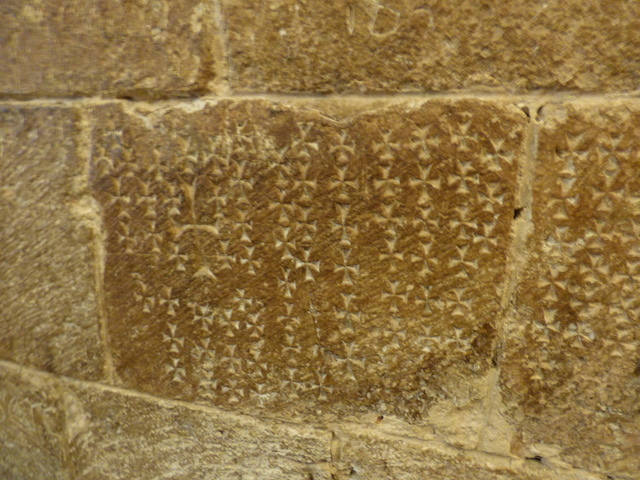 Any example of “graffiti” (etchings in stones) from the Byzantine era inside the Church of the Holy Sepulcher. 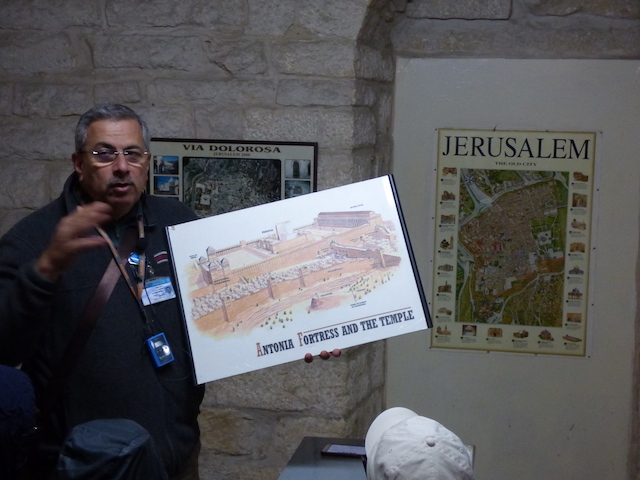 People have been writing on walls for centuries! 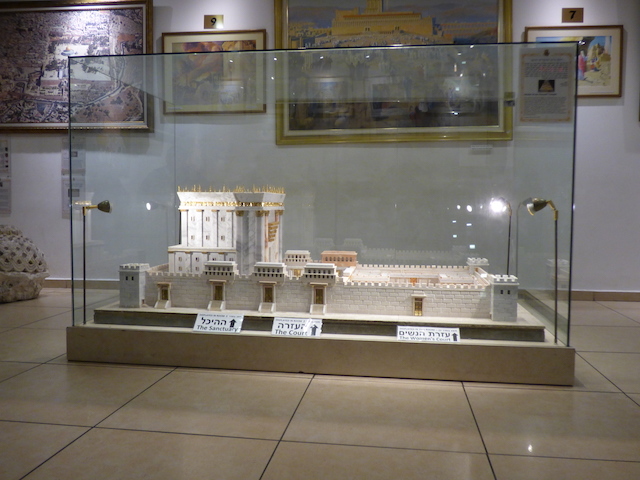 The Temple Mount Institute has been preparing for the rebuilding of a third Jewish temple on the Temple mount by preparing all of the temple vessels, instruments, garments, etc for use in that temple. 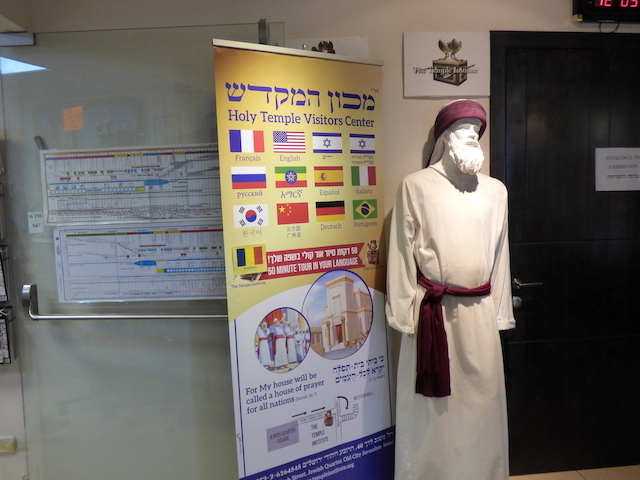 I”ve been following their progress for years. 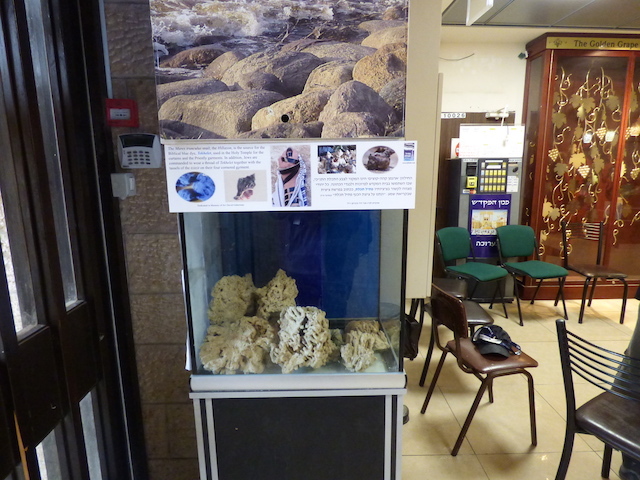 Their visitor center has all of the items on display. 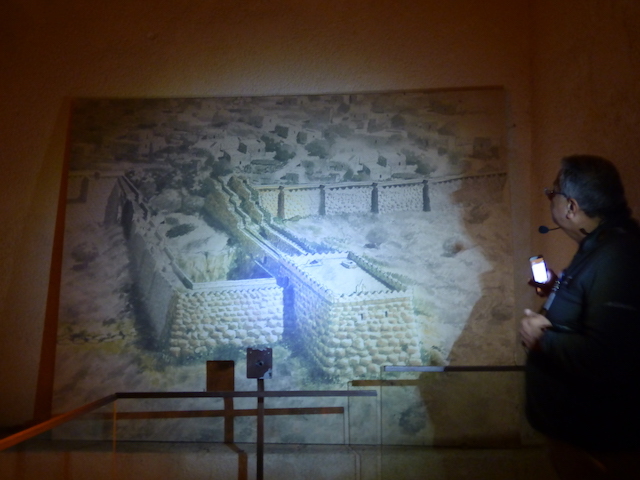 Unfortunately, no photography inside the exhibit is permitted. 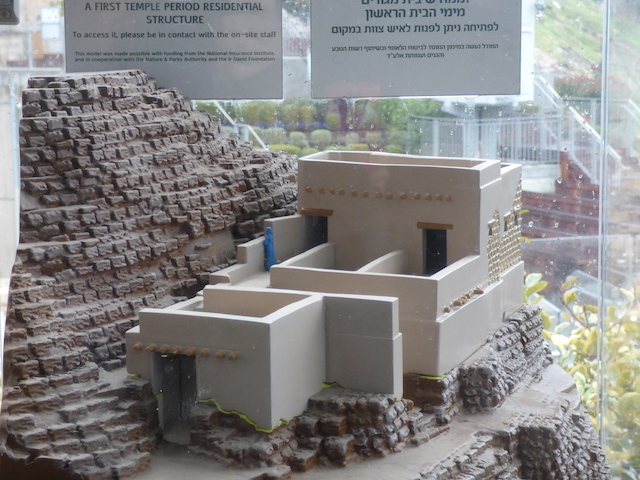 However, I snapped this photo of a model of the 2nd Temple before that announcement came over the speakers. 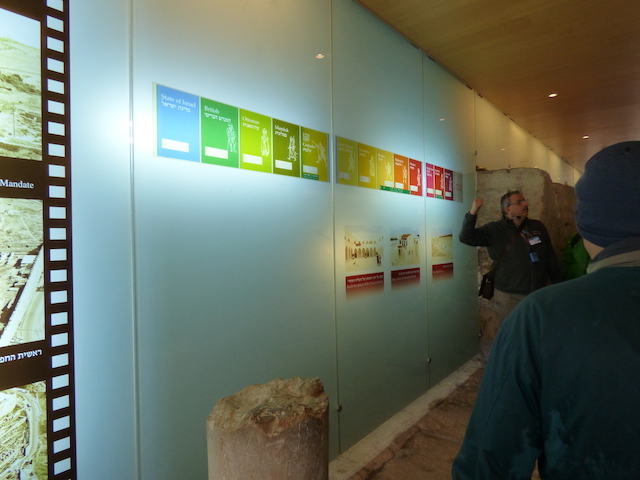 There is a large museum with exhibits and display here, including this timeline of history. 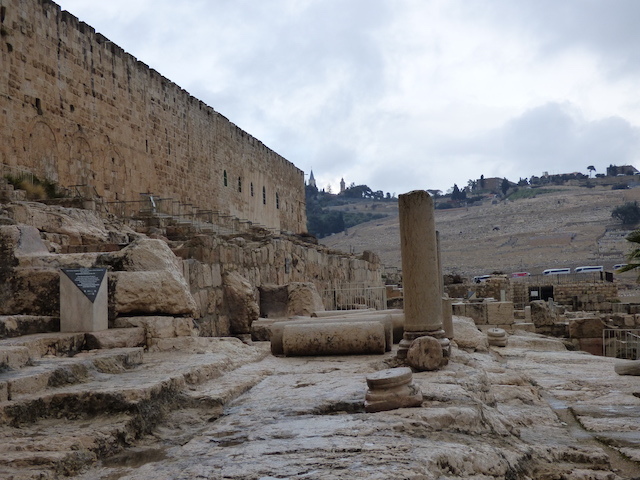 Here’s a wide shot of the southwest corner of the Temple Mount. 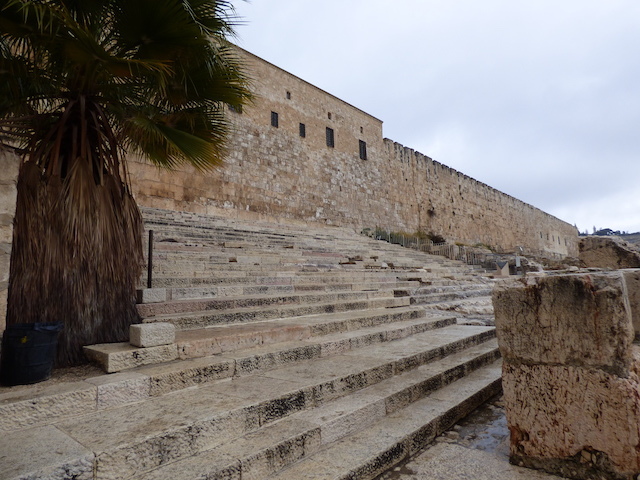 These steps are the southern approach to the Temple Mount (now blocked). 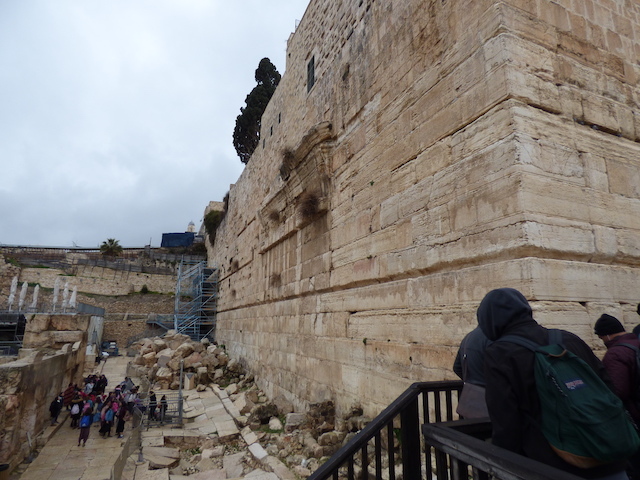 The gate in this wall is the “Hulda” gate. 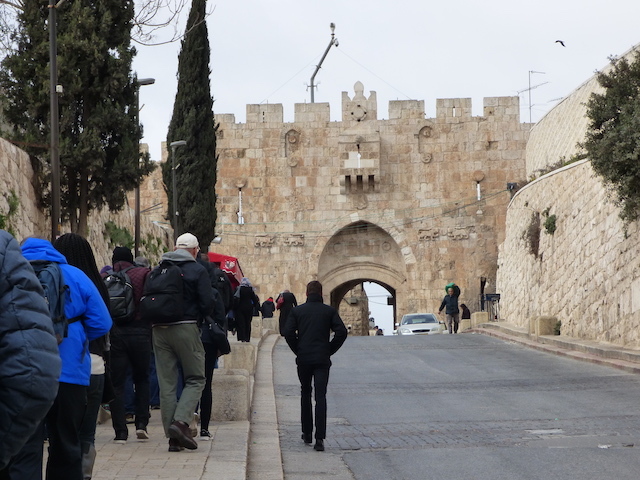 It is the gate most often used by the poor. 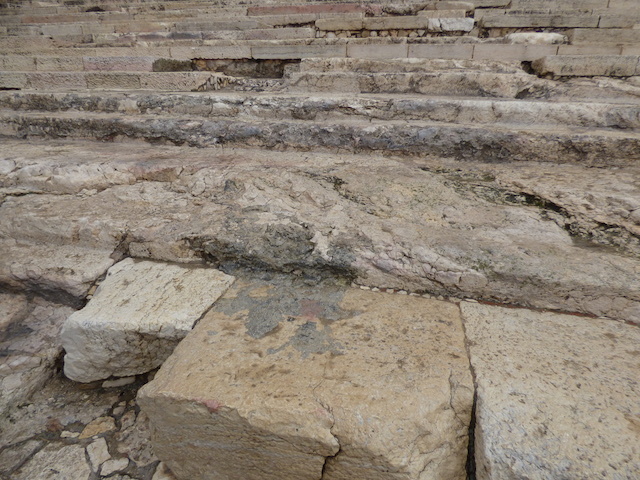 The lowest steps here are first century and were certainly used by Jesus and His disciples when they visited the temple. 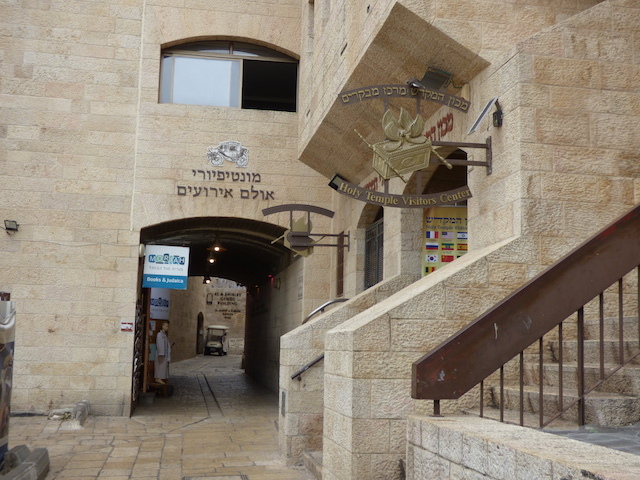 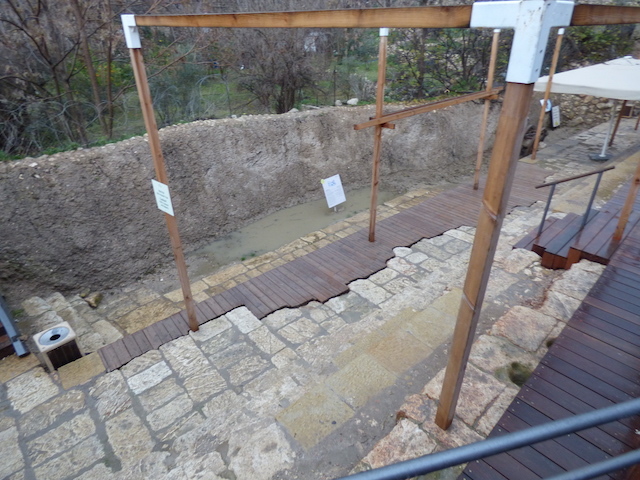 This Mikvah (ritual bath) is located just before the gates. 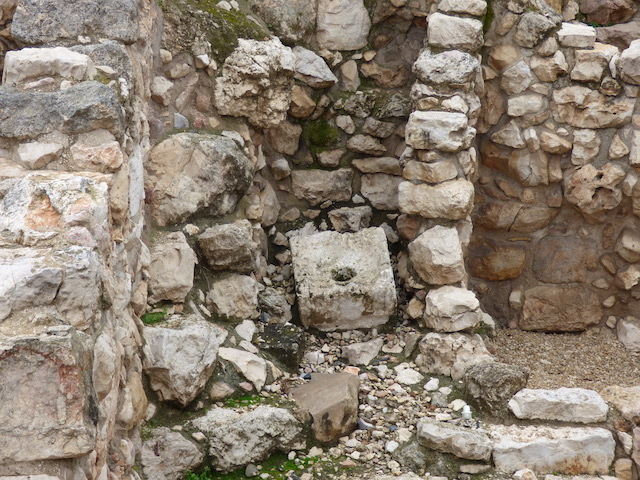 Anyone entering the Temple courts would have to purify themselves before proceeding. 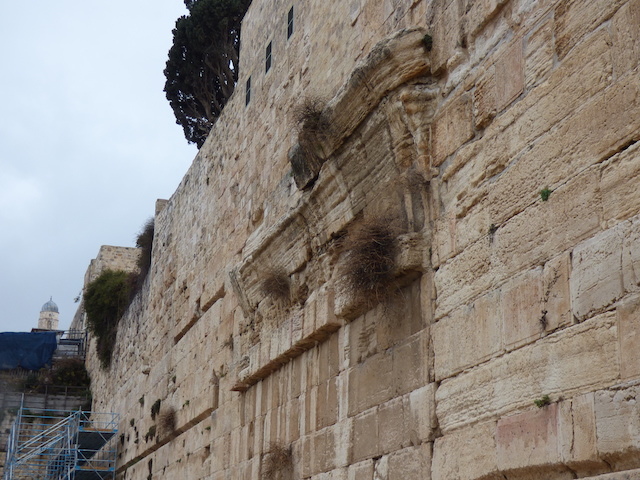 Here you can see (jutting out from the wall) the remains of Robinson’s Arch. 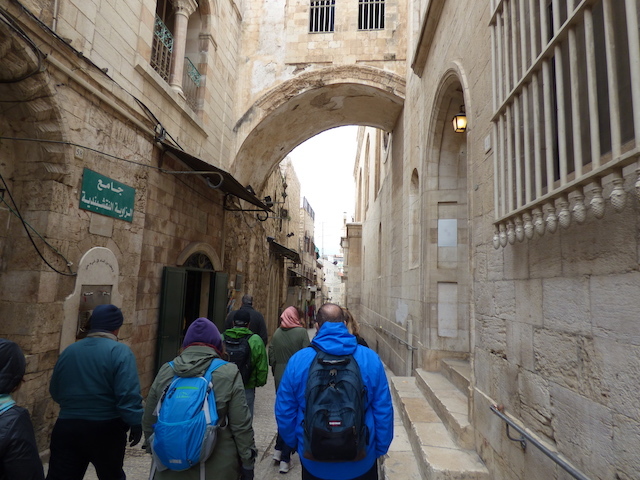 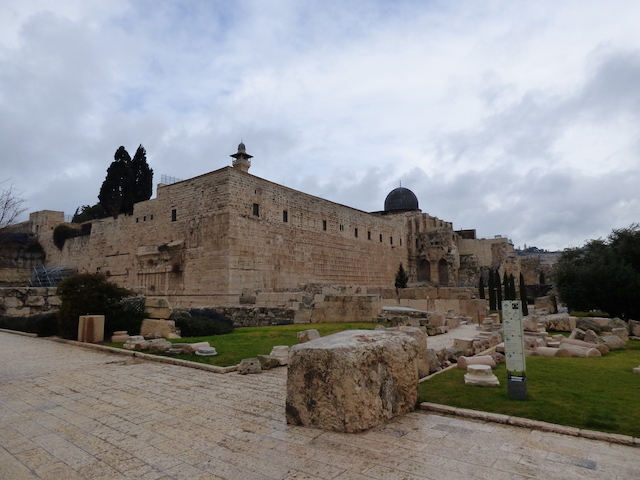 It originally stretched to a building on the left and provided access to the temple mount. 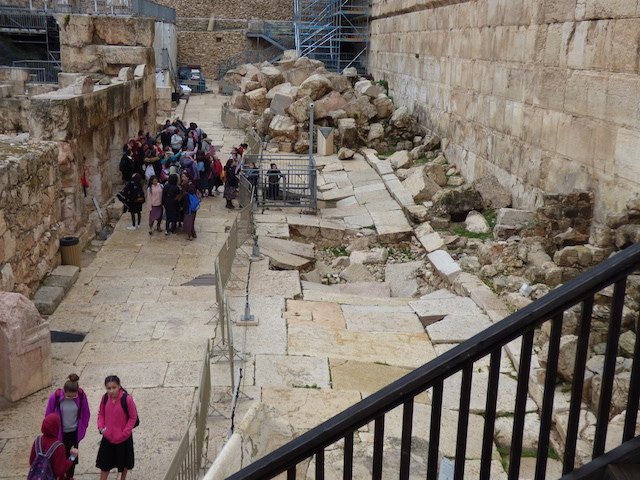 When the arch collapsed, it broke the paving stones below and created a hole that you can see today. 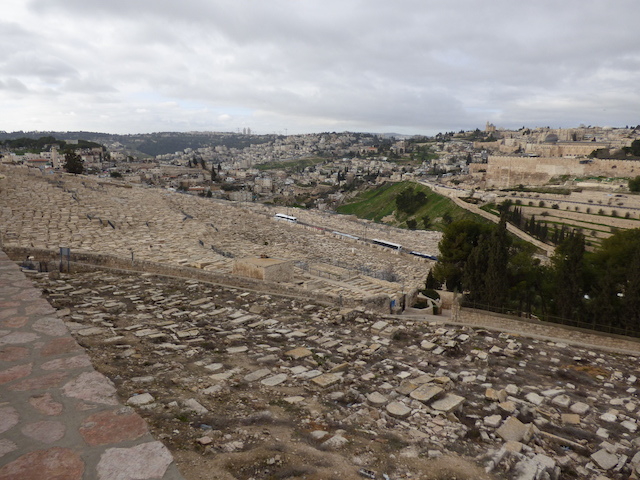 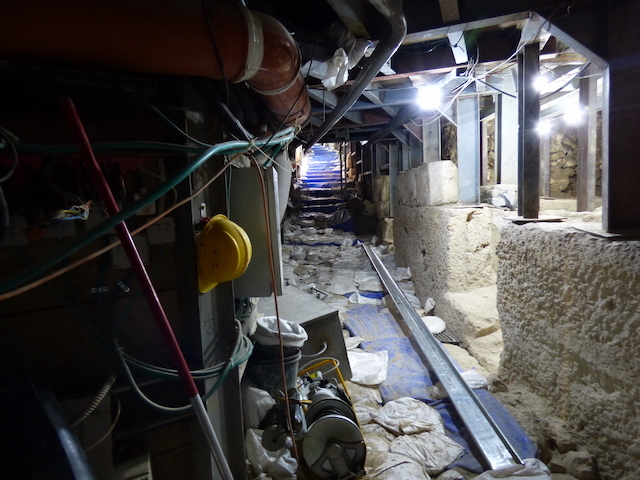 This site, which provides access to Hezekiah’s tunnel was only excavated 8-9 years ago. 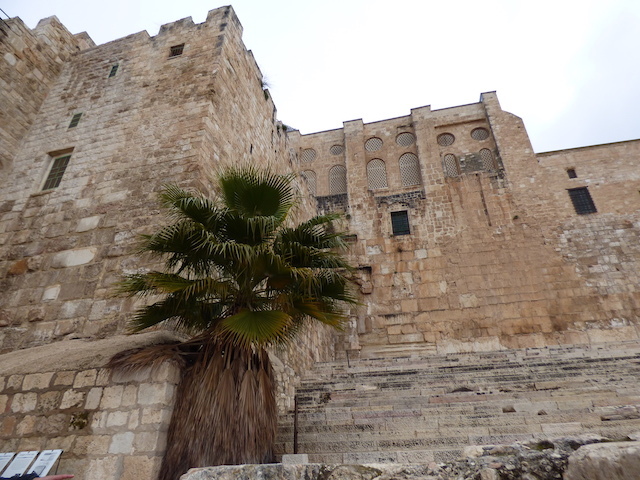 Many scholars believe that it is the ruins of the King David’s palace that was built by for him by the King of Tyre. 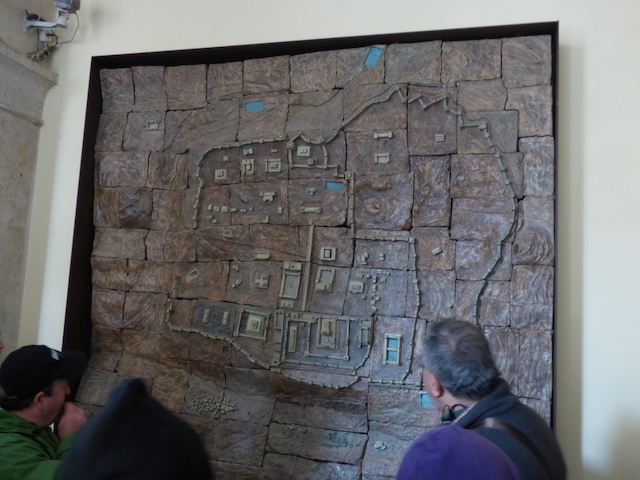 This model shows what the houses constructed adjacent to the palace would have looked like. 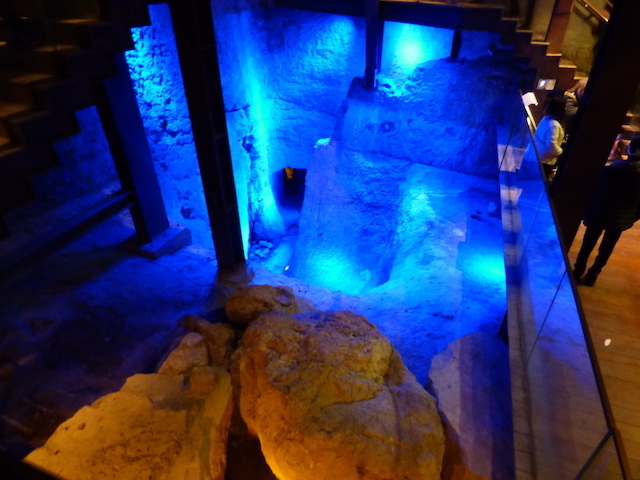 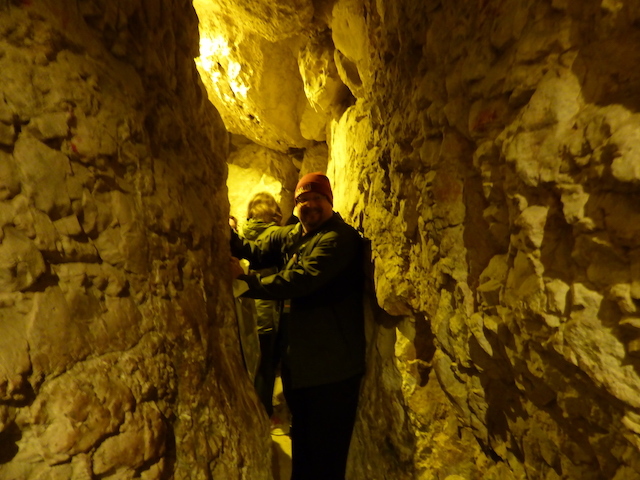 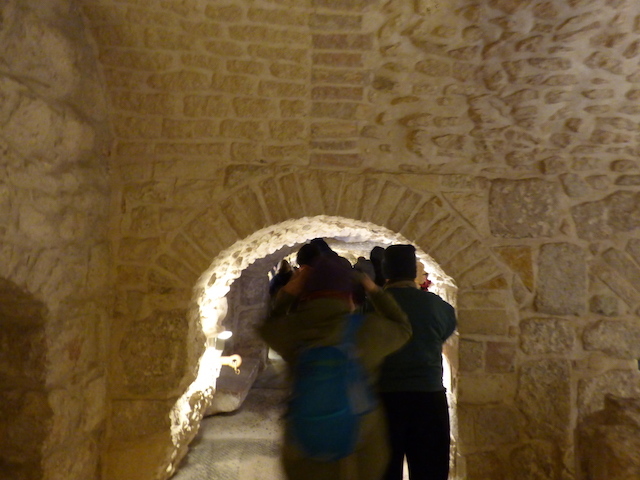 The second tunnel was constructed during the reign of King Hezekiah. 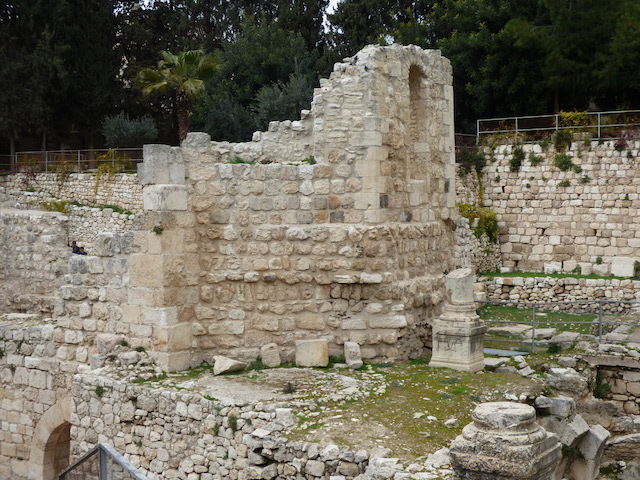 Workers started from both ends (at the pool of Siloam outside the city and inside the city walls). 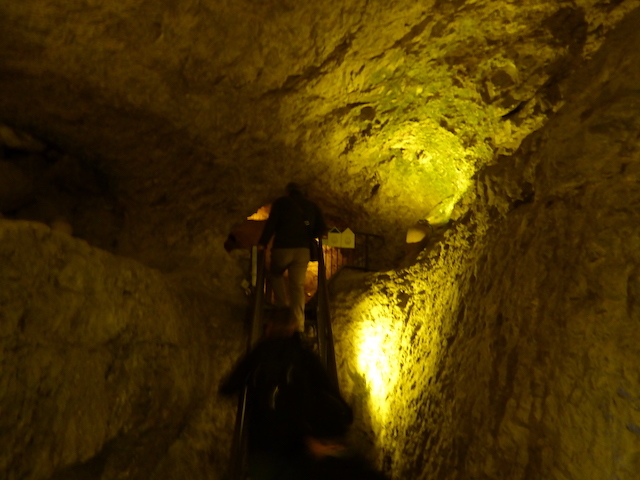 The total distance covered was 1,750 feet. 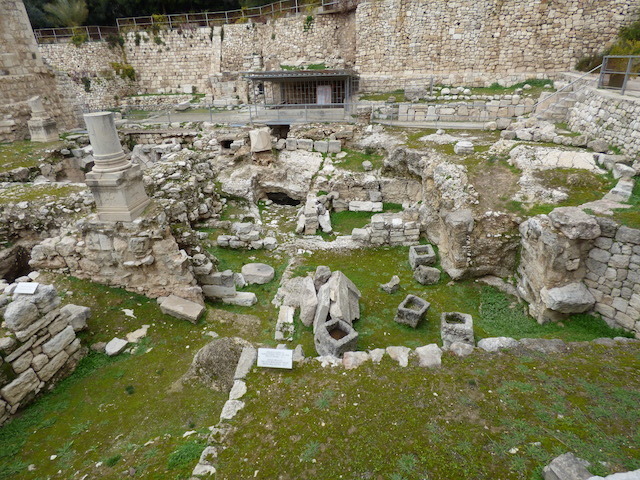 Even with not modern equipment, the two teams met in the middle. 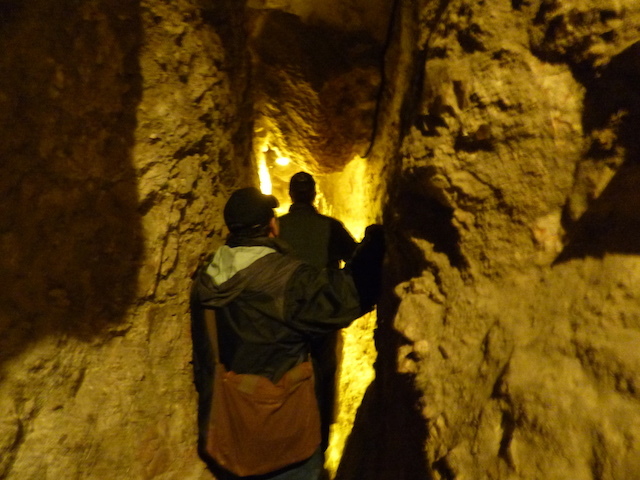 The tunnel is very narrow and (right now) is filled with water above your knees. 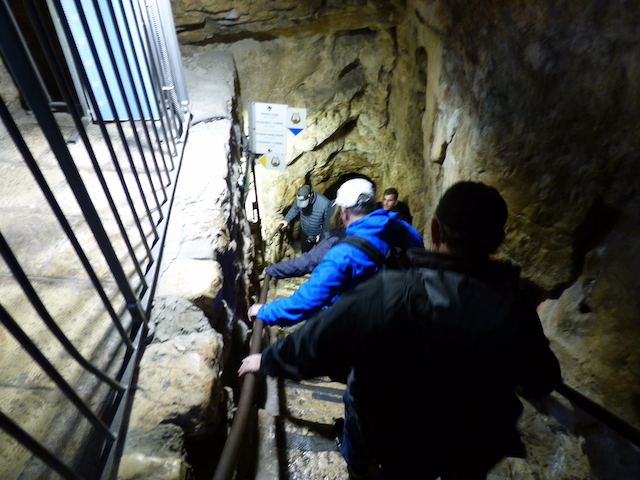 Below were are entering “Warren’s Shaft”. 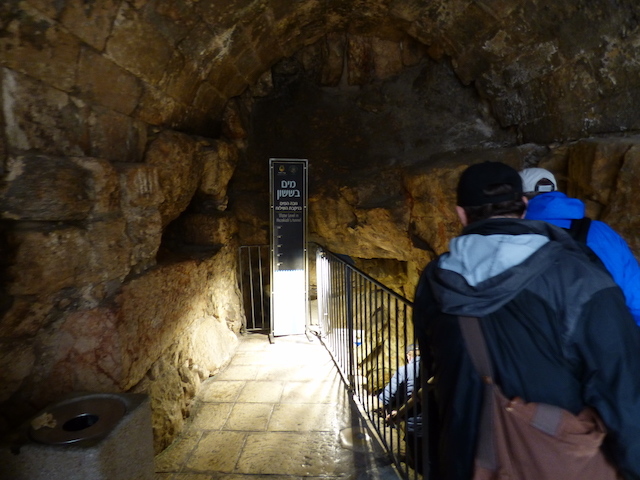 At the base you can either either the “dry” tunnel or the “wet” tunnel and proceed to the Pool of Siloam. 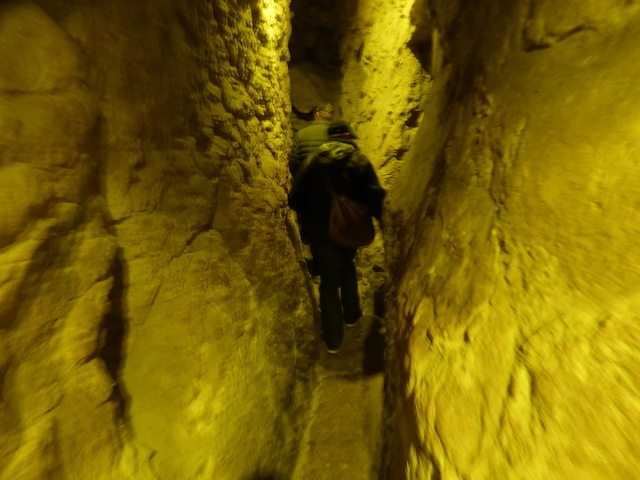 You can see that it gets a bit narrow in spots. 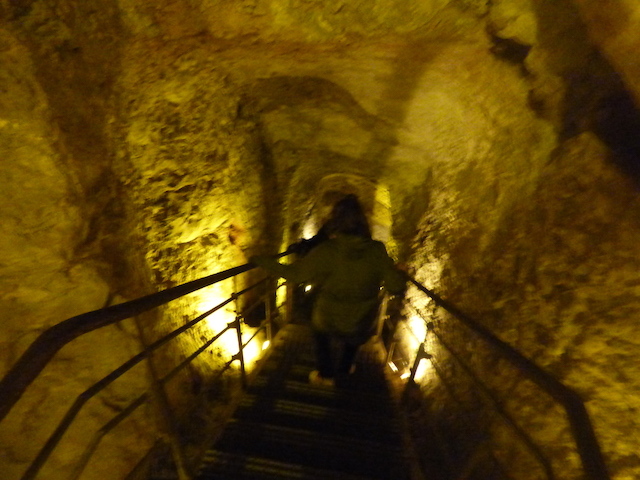 And here’s evidence that I didn’t wimp out! 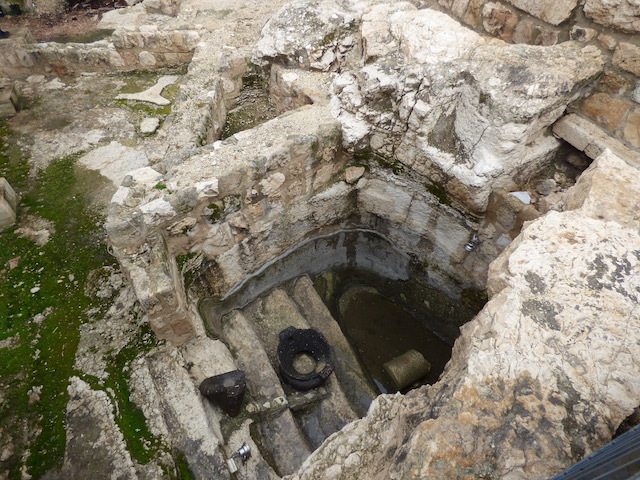 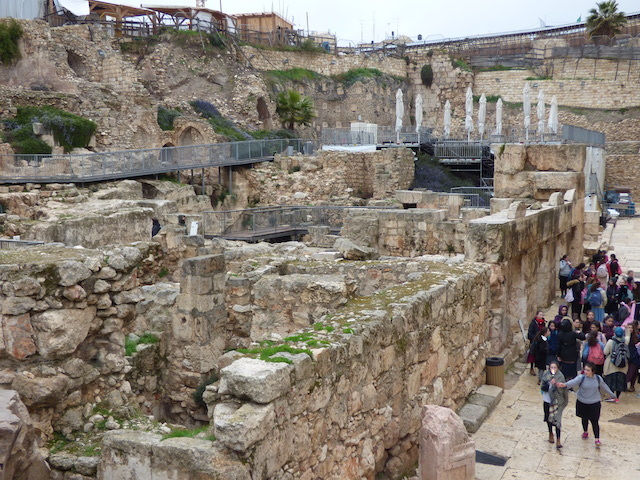 Only a small portion of the Pool of Siloam has been excavated. 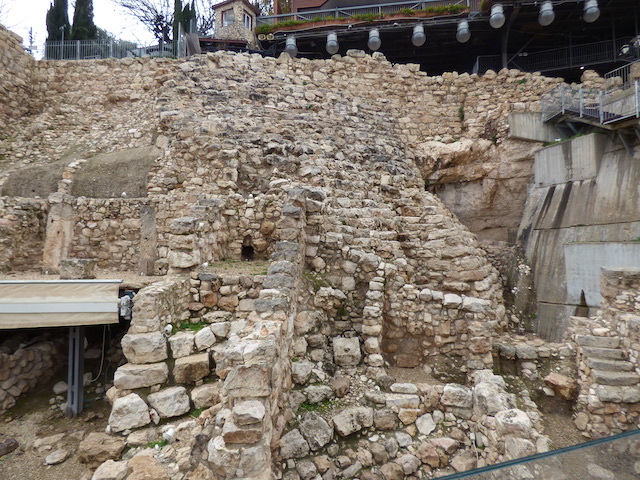 Much of the property is owned by the Greek Orthodox church which refuses to permit any additional excavations. 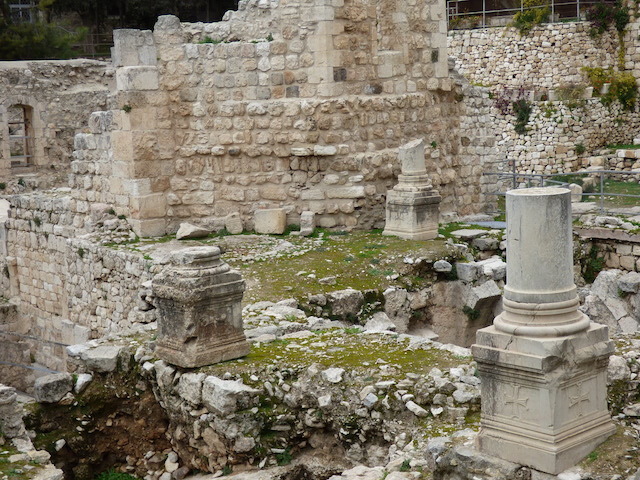 At the Pool of Siloam you can see the beginning of a 1st century (Herodian) street that runs all the way from this point to the southern steps of the temple mount. 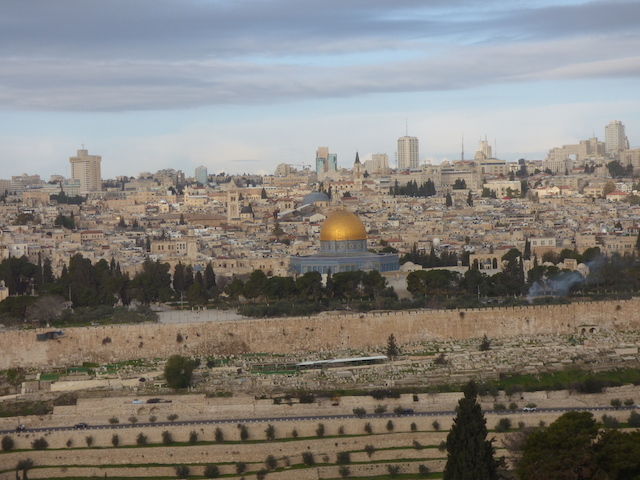 That’s quite a distance. 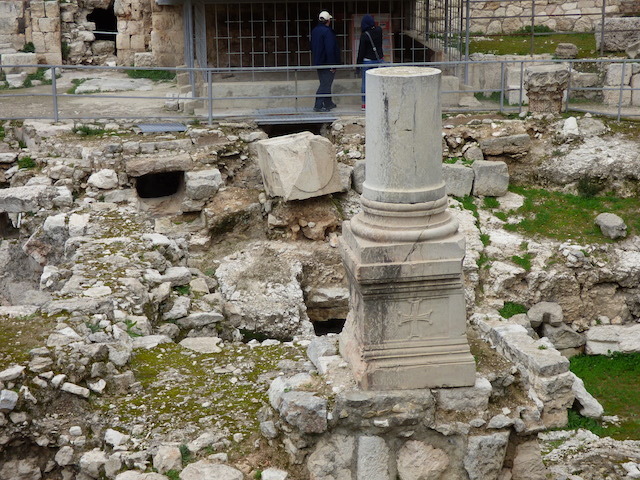 It’s not currently open. 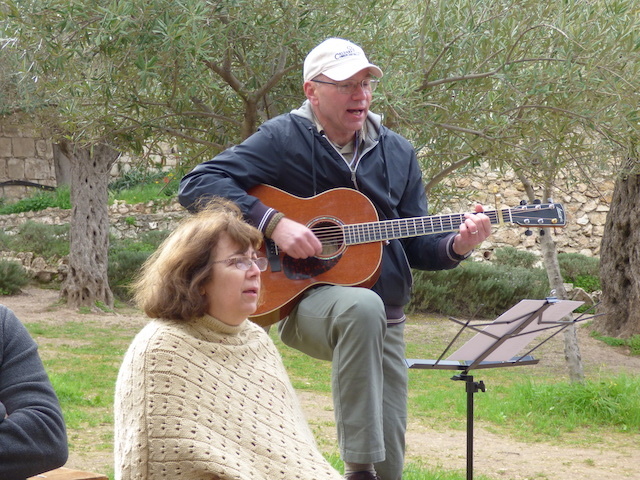 Jim, I am totally enjoying these pics you are sharing. 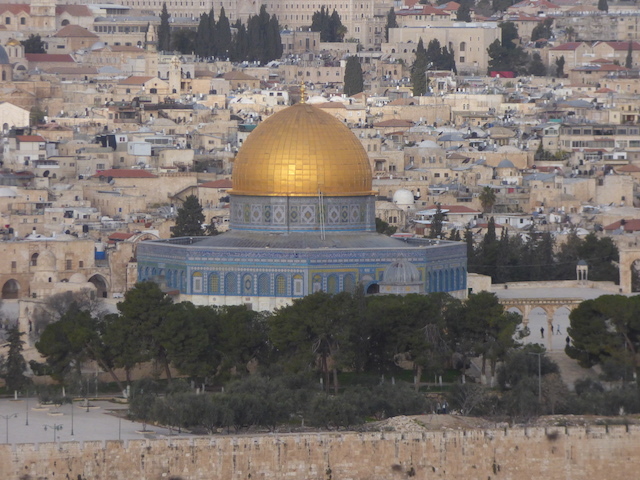 It might be the closest I get to see this but you never know. 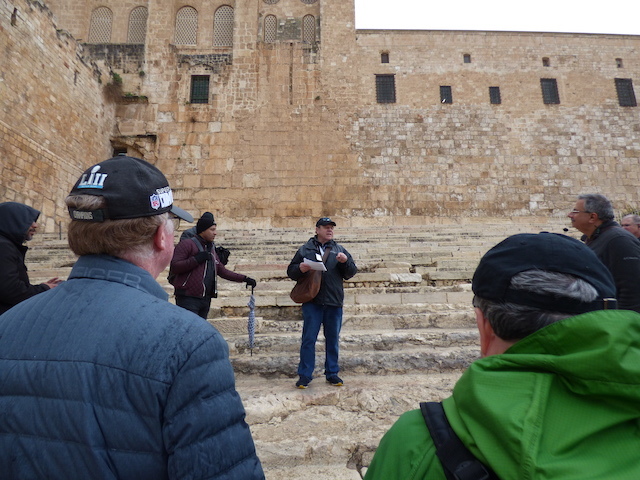 So glad you have this opportunity and you are taking the time to share with us.